I’ve been wanting and had on my ‘to do’ list for quite some time to plow up a small section of our concrete yard for the larger more traditional style veggie garden. Last evening, despite 50mph winds and no rain, I had finished cooking dinner, kids were fed, homework was done, dishes were at least in the sink…and I sauntered outside to grab my hubbys new roto-tiller toy. I diligently plowed to and fro covered in a cloud of dust but I managed to till myself a 13×23 garden. Since the ground hasn’t been worked in many decades, I added water the last few days. 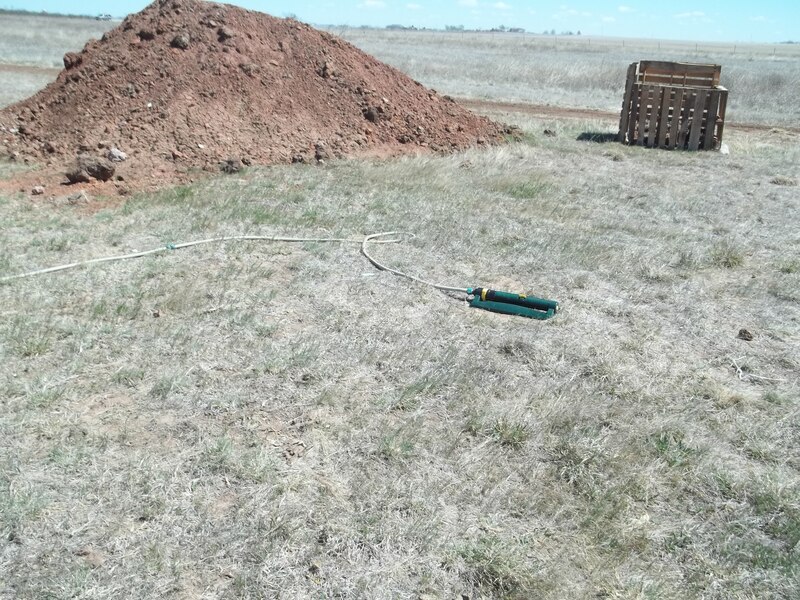 Although you’d never know it by the dust storm I created while tilling. Otimally when you start a new garden, you want the soil tilled nicely about 6-8″, but since we’ve had zeor moisture in the last few months other than what I’ve added, I couldn’t ask for much beyond the 6″. 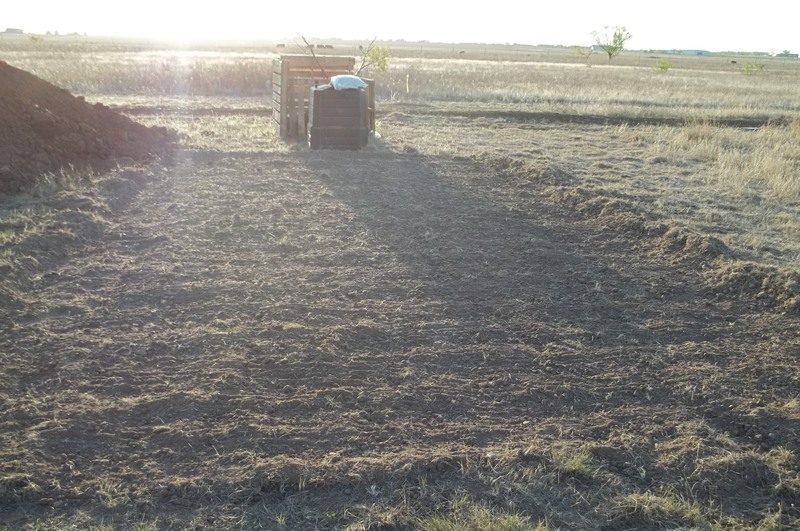 After adding some soil amendments I will try and get the soil tilled down to about 8-10″ deep and work in more organic matter. I will also work in some 10-10-10 fertilizer seeing as how both the corn and okra can be some heavy feeders. 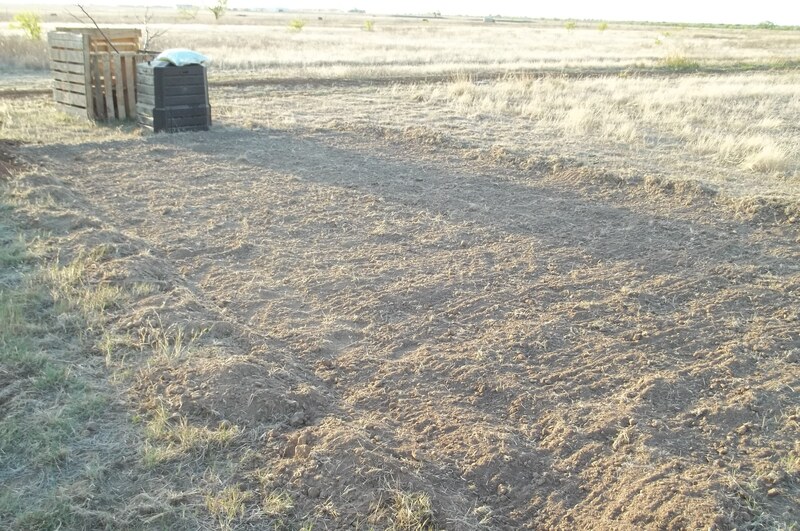 Newly plowed garden...needs lots of water and TLC! The new garden is at least formed. I purchased several bags of compost with manure added to it that I will till in during the next day or so. I will also give it lots of H20 attention as well. This morning while I had a few extra minutes, I took the time to sketch out the garden plans. On the far east side (top of the picture) will be four, 13′ rows to sweet corn. I will also plant cucumbers and summer squash next to them and the corn stalks will serve as a trellis for them. I am hoping this form of vertical gardening will be a success. I will have four east-west running rows of okra, then the front portion will be primarily for cantaloupe, watermelon and zucchini. I have opted to plant my newly purchased eggplant transplants in the raised beds where the radishes had been and run the tomatoes in the on-ground bed I made a few weeks ago. This entry was posted in Companion Gardening, General Gardening, Soil Amendments, Starting a New Garden Bed, Vertical Gardening and tagged breaking up dirt, new gardens, oklahoma gardening, vertical gardening. Bookmark the permalink.